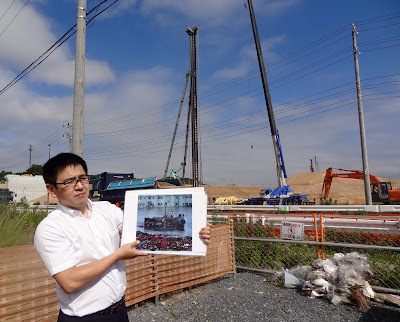 Kudo-san with a picture of the tsunami's immediate aftermath. On my last day in Minamisanriku, a small group of us from World in Tohoku signed up for a tour of the town's downtown coastal area, which was decimated by the earthquake and tsunami of March 11, 2011. Until then we had been immersed in brainstorming ways to grow the organizations of a group of dedicated and inspiring social entrepreneurs. They were so positive, and so alive that it was hard to viscerally grasp the scope of the natural disaster that had spawned some of their ventures. I wanted to learn more about the effects of the disaster that left nearly 22,000 dead or missing and see with my own eyes the state of the ongoing reconstruction. I had read accounts of the tsunami in which survivors described seeing "a white line" far out on the bay, which moments later had transformed into a giant wall of destruction rushing toward them. What had that deadly wave, rising at points as high as 30 feet, wrought, and what was being built in its place? Our guide, Kudo-san, met us at the the community center where our retreat was held, and started with a wrenching video and overview of what had happened. A former insurance company worker, Kudo-san, 44, told us that he considers himself lucky: he, his wife and four children were all spared when over 1,200 other townspeople were not. He and his family are among the 9,746 evacuees from Minamisanriku, and the close to 3,100 who are still in temporary housing. Yet that didn't matter because his family was intact, unlike so many others. Located over 90 miles from coastal Fukushima, the site of the nuclear reactor meltdown, Minamisanriku's fisheries, shellfish beds and seaweed harvesting are on their way to recovery, thanks to government and public support and the way the fishermen have banded together to share equipment and support each other. a shrine to the disaster's victims. Kudo-san then drove us to the former town center, still a giant construction site dotted with cranes, giant mounds of dirt from the construction of new levee, hard-hatted construction workers and their vehicles. 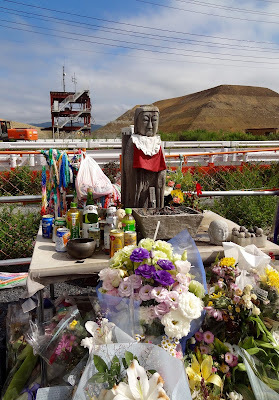 Before us was a shrine centered on a mournful-looking Jizo Bodhisattva as well as offerings of flower bouquets and bottles of sake, beer and tea for those who had perished. The shell of the former Disaster Prevention Center. Directly beyond the road that bisected the construction zone stood the rust-colored skeleton of a building, the city's former Disaster Prevention Center. When the tsunami warning sounded, Kudo-san told us he saw workers at the nearby town hall flee to the three-story building, but he decided that it would be wiser to get to higher ground. He made the right decision; of the 50 or so town hall employees who reached the rooftop, only 10 survived when the tsunami tore through it. Among those who survived was the town's mayor, and among the dead was Miki Endo, 25, a Disaster Prevention Center employee who heroically continued to broadcast tsunami warnings over the town's loudspeaker system until she was swept away by the tsunami. A bitter reminder to townspeople of the losses their families suffered, they would like to see the scaffolding torn down, Kudo-san told us. The Miyagi Prefectural government has a different view; it would like to keep the building's shell standing as a memorial and reminder of what happened. For now, the arrangement is that the prefectural government will maintain the building for 20 years and then its fate will be decided. Frozen clock marks the time of the earthquake. Next we traveled to the high ground above the town where three of its public schools are located. 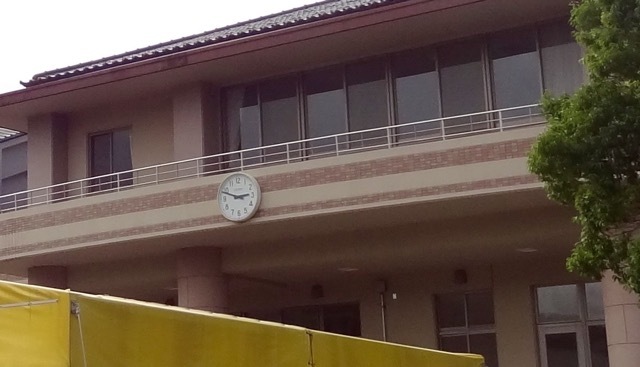 At one school, the clock was frozen at 2:48 p.m., the moment the magnitude 9.0 quake reached Minamisanriku. This was one of the town's designated shelter spots, and preparations were underway for the next day's graduation ceremony. 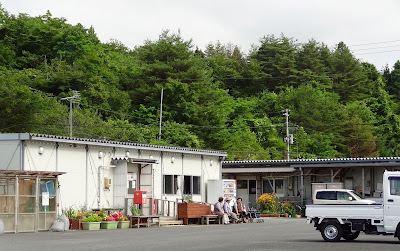 Kudo-san told us that a teacher and a student walked to the edge of the hilltop school grounds where we stood to watch the approaching tsunami from what they thought was a safe spot. It wasn't though; because of the coastal geography, part of the tsunami squeezed around the town and slammed into them from behind, killing both of them. Residents relax in front of their temporary housing. A good number of townspeople, lulled into complacency by the frequency of earthquake alerts and the much smaller but overhyped 2010 tsunami that resulted from an earthquake in Chile, did not respond quickly enough to warnings and were lost. But Kudo-san says that everyone now realizes "the importance of over-estimating, of assuming the worst." Amid this barrage of overwhelmingly sad detail, Kudo-san seemed to want to impart a last, happier image. He remembered the irony of being surrounded by water, and yet not having enough of it. There was no electricity in the immediate aftermath, of course, but the water shortage was much more acutely felt. "For a family of four, we only got two buckets per day," he told us. The happy part was that every four days he got to take a bath at the hot springs of the nearby Kanyo resort hotel, which had been spared damage. "Those were our happiest moments," he said. Tempura Matsui's shrimp and shiso leaf tempura with zarusoba. 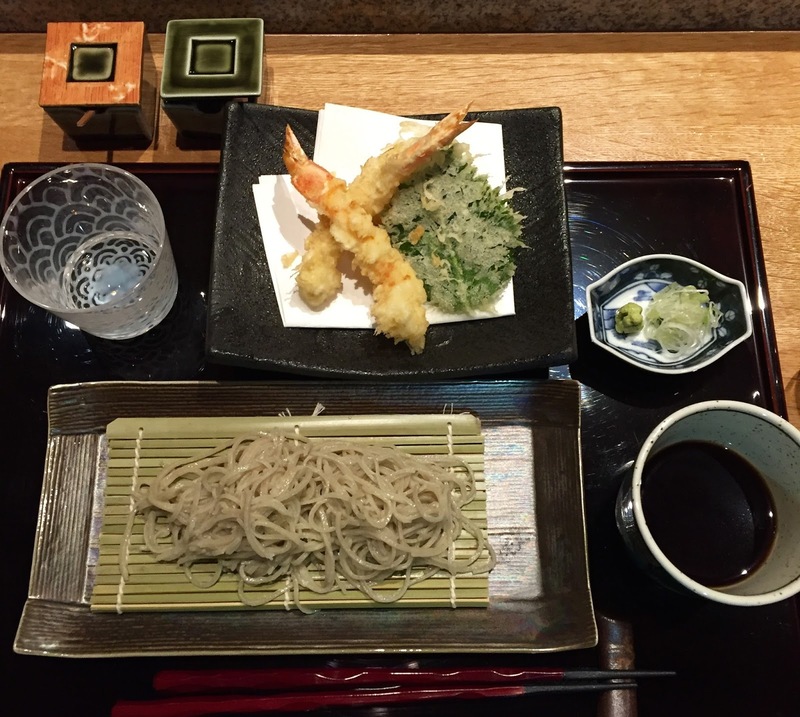 While ramen continues to be all the rage in New York, soba--its less macho and more shibui (austere, simple & elegant) cousin--has many pleasures to offer. During summer days of wilting head and humidity one of the great cooling-off dishes is a serving of zarusoba, the chilled noodles served on a bamboo mat and dipped into a bowl of soy sauce-based broth mixed with grated wasabi and sliced scallions. Though there are a number of places in New York where you can find the classic combination of soba with shrimp tempura, the Michelin-starred East 39th Street specialty restaurant Tempura Matsui takes it to new levels of refinement. Here, chef Takashi Kiyomiya hand-grinds Japanese-grown buckwheat with a sturdy $500 Mikage granite mortar, or ishiusu (石臼)purchased in Japan. On a recent visit, Kiyomiya-san demonstrated how he places five grains of buckwheat (imported from Hokkaido) at a time into the mortar, turning its wooden handle three times per five grains. No wonder it takes two hours to complete one batch of noodles! Once that's done, the flour is sifted three times and then mixed with wheat flour (80% buckwheat to 20% wheat) and then water (45-46%) to create the dough. 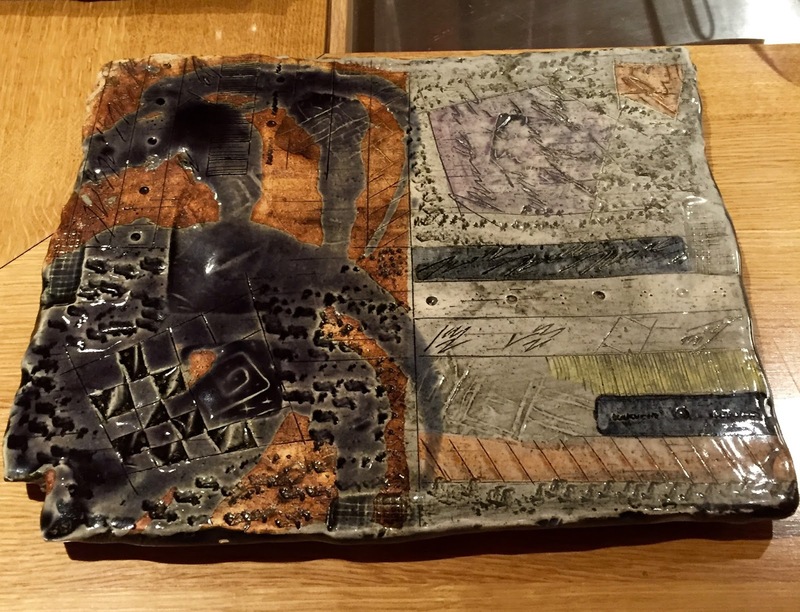 Gifu Prefecture ceramic artist Hideki Hayashi's Mino-style plate. Sadly, after opening the New York branch of his restaurant, tempura master Masao Matsui, who had been suffering from cancer, passed away in February. The restaurant has forged ahead, though, and is now celebrating its one-year anniversary, headed by Chefs Shin Kato and Kiyoshi Chikano. Tempura Matsui is not your weekly neighborhood hang-out, exactly--newly unveiled set menus range from $140 to $230. But the level of technique is very high, and diners can sit at the counter to watch Chefs Kato and Chikano (above in video) deftly tempura fry everything from scallops wrapped in nori to shrimp-stuffed shiitake, lobster and okra, using the blunt end of long wooden chopsticks. 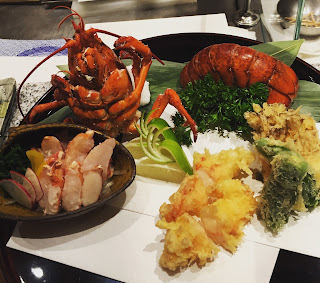 If you really want to gild the lily this summer, the $230 menu includes Chef Chikano's lobster tail tempura with baby corn and seasonal vegetable tempura, as well as steamed lobster claws and a vinegar-soy dipping sauce. Or, you can add this course as a market-priced supplement to one of other set menus. Wherever you are, I hope you stay cool this month and can find zarusoba and shrimp tempura someplace near you! Yamamoto, bottom left in yellow. Photo courtesy of Shinya Sotowa. I've just returned from an eye-opening odyssey to the Tohoku region of Japan with the non-profit social entrepreneurship organization World in Tohoku (WIT). Through WIT I was able to meet some of the people behind the dynamic social ventures formed in the wake of the March 2011 earthquake, tsunami and nuclear disaster and learn how they are trying to improve social, environmental and living conditions in the region. Shinichi Chiba's cafe Le Roman. Located in the northeastern part of Japan, Tohoku is a beautiful region filled with awe-inspiring bays and coastal coves, forests, deep-green mountains and fields, amazing seafood and warm-hearted people. They'll tell you how 3.11 affected them if you ask, but otherwise have a cheerfulness and openness about them that belies their experiences of loss and hardship. I'm thankful to WIT for allowing me to go below the deceptively placid surface of the region to see the struggles to rebuild that are underway. Visit to post-natal care organization Mammaru Mom Iwate. Photo courtesy of Mary Kearns. World in Tohoku was launched after the Great East Japan Earthquake in 2011 by Mio Yamamoto, who has a background in venture philanthropy and degrees from MIT's Sloan School of Management and Tokyo University. Although WIT has held a number of "learning journeys" to connect expert advisors with Tohoku social ventures, this was the first international collaboration. Our "cross-border Learning Journey" introduced nine Tohoku social ventures (five new to WIT's portfolio this year) with 10 U.S. participants and 10 Japanese participants. All of us were surprised at the depth of the collaborations that resulted from the week-long journey, and the strong bonds that were formed. The range of expertise Mio-san and her two-person part-time staff collected was impressive, too, spanning the fields of finance, fundraising, investment, entrepreneurship, arts and design, urban planning and sustainability, law and international development. Brainstorming a with the Meiten lacquerware team. 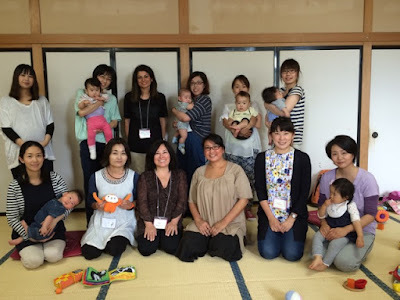 The social ventures we visited and collaborated with included two pre- and post-natal support organizations for mothers and families in Tohoku, a much needed service considering that stress levels were so high in the wake of the disaster that incidences of child abuse were reported. Another, Asuiku, provides safe learning spaces and e-learning for poor and at-risk youths. To our surprise, we learned that poverty was a hidden fact of life in Tohoku before 3.11. "The disaster simply revealed the poverty," said Yusuke Ohashi, Asuiku's founder and director. In fact, childhood poverty in Japan is the fourth highest in the 35 OECD member countries, after Mexico, the U.S. and the U.K.
Expedition to the Watari Greenbelt Project. Another social venture, the Watari Greenbelt Project, is dedicated to re-growing trees in the 2.5-mile long coastal area of Miyagi Prefecture, where a 400-year-old forest was destroyed by the tsunami. The staff from Replus captured the hearts of all of us for their dedication to providing caregiving, training and education to people of all ages who are still suffering the physical and emotional toll of living in shelters and temporary housing. scissors," led by Replus's Takayuki "Occhy" Ochiai. Meiten's "Meguru" line of lacquerware bowl sets. Two other ventures that generated much interest were Wataru Kainuma's Meiten, which aims to bring back the traditional craft of lacquerware in Aizu Wakamatsu, Fukushima, and World Chodoii Lab (World Just Right Lab) in Matsushima, Miyagi Prefecture. 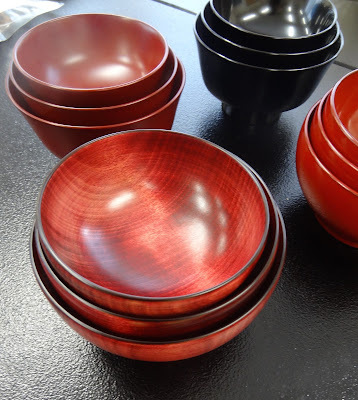 Kainuma-san told us that only two percent of lacquerware purchased in Japan is made in the country today--the rest, cheaper takes on the real thing, is imported from China. World Chodoii Lab grew out of founder Shinichi Chiba's own experience as a fifth-generation owner of several cafes, a well-known cake shop and a gift store in the beautiful coastal town of Matsushima. It's more of a design concept and philosophy, a sort of return to the "small is beautiful" idea of E.F. Schumacher. "After the tsunami," Chiba-san told us, "I thought, 'Why keeping making things we don't need?'" The Chodoii model shuns growth for growth's sake and holds that"good is better than big" and "happy is better than rich." Amen to that! This is just a quick summary of the WIT Learning Journey, which I will be writing more about, so stay tuned. Mark Stambler's miche and sourdough. It's been a while since my last post, but I'm back at last, inspired to write by a chance encounter with a Northern California heirloom grain farmer, a Southern California baker and a rejuvenated form of wheat. The two humans, farmer Mai Nguyen and baker Mark Stambler, gave a lecture at the recent L.A. Bread Festival, held at the city's recently revamped Grand Central Market. 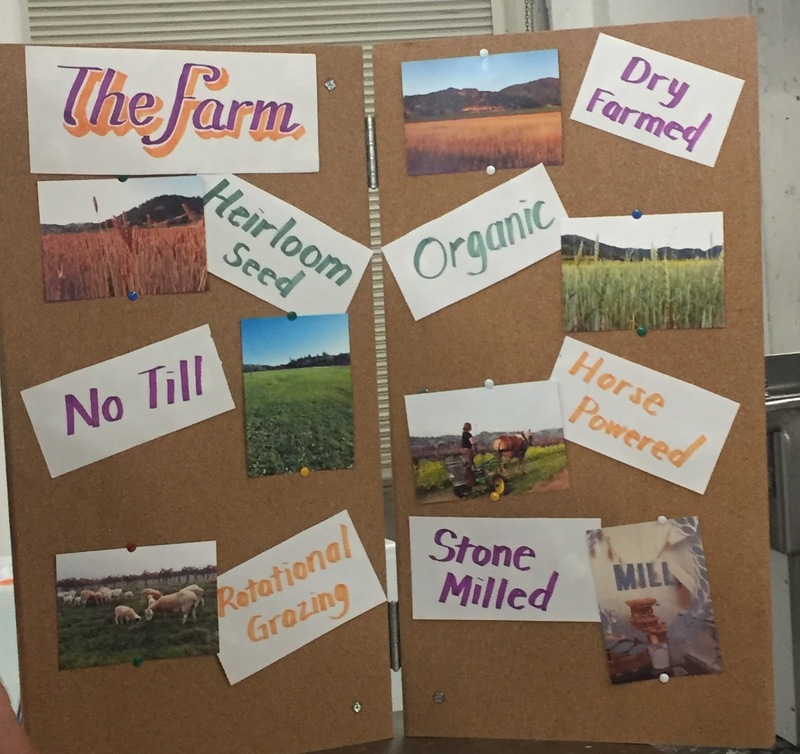 Mai, a perky Vietnamese American with large horn-rimmed glasses who farms on five acres of land near Ukiah in Mendocino County, grows four different heritage grains. Her favorite is California's Sonora soft white spring wheat. Adapted from grains brought to Mexico in the late 1600s by Jesuit priests, it made the country's first wheat (instead of the usual corn) tortillas possible. By the early 1800s it was widely planted in California, which was then still part of Mexico. Sonora wheat is considered California's first landrace wheat, meaning it's a grain selected not for ease of production or length of shelf-life, like most modern hybrids, but for taste and texture. Mai explained that the revival happened roughly seven years ago, thanks to the efforts of Glenn Roberts, the San Diego native and founder of Anson Mills; Sonoko Sakai, whose organization Common Grains focuses on reviving heritage grains in Southern California; and the Whole Grain Connection, devoted to the proliferation and availability of sustainably grown whole grains. Despite this ferment of whole grain activism in the state Mai says that not only is it still hard to come by Sonora soft white seeds, finding quality seeds can be even more difficult. As a baker, Mark likes Sonora for its softness and buttery scent, both of which make it well suited to pastries and cakes. Because it doesn't have a high gluten content it is ideally suited to making tortillas, he says. For bread making he mixes it with white flour to get a loaf with good "oven spring." He also knows how he'll have to adjust his recipe depending on where in the state the wheat was grown. The most common question he hears about baking with heritage grains, said Mark, is how recipes written for store-bought flour from commodity grains must be adjusted. To him, it's simple: add more water if the dough is too stiff, and more flour if it is too loose. Agriculture as practiced by Farmer Mai. Long cultivated in temperate to hot and dry regions of Mexico, Sonora wheat is well suited to similar conditions in the Ukiah valley, Mai notes. The grain's drought resistance is key to her success, because she dry farms, meaning that she relies only on rainfall to water her crops. She also practices no-till farming to prevent soil erosion, increase its water retention and maximize its microbial diversity. She uses a horse-drawn plow, which in addition to providing a way better farming experience than riding a tractor, reduces her carbon footprint and prevents topsoil compaction. One of the challenges of being a small-scale grain farmer in an agribusiness-dominated commodity crop country is that it's hard to find appropriate-sized equipment. Mai was able to track down a small combine from a farmer in the Sierras. Though built for grain trials and nursery harvesting, it suits her needs just fine. Her purchase reminded me of a similar find that I wrote about in this Civil Eats article: the 62-year-old small combine that upstate New York farmer Ashley Hollister had to travel all the way to Ohio to collect. Combines take care of all aspects of the harvesting process, including reaping, threshing and winnowing, and their three-in-one utility is where the name "combine" comes from. Done by hand, as it once was, the process is laborious to a crazy degree. Mark has tried it himself. Growing the wheat is the easy part, he says. When his 10' by 6' plot was of wheat was tall enough, he cut the heads off with scissors. But the threshing, or removing the outer hull of the grain, took grit. Thrashing at his plastic bag filled with wheat with a stick didn't work so well, nor did smashing it with bricks. It wasn't until he ran over the wheat with his Honda Civic that he finally started getting somewhere. Separating the wheat from the chaff, or winnowing, was equally frustrating. He set an electric fan in front of a bowl and tossed the threshed wheat in the air so that the chaff blew away and the heavier wheat fell into the bowl. But he needed to do this repeatedly, and then still spend an entire afternoon picking through the wheat to finish the task. A day's work netted him about four ounces. The lengths DIY-ers will go to to live the manual labor life of our forebears! For a busy farmer like Mai, the combine she bought is a must-have. It also beats out what she calls "the catastrophe that was last year's harvest." She hired the one person in her region with a mobile combine and was dismayed to learn she was to be the "guinea pig" for his new machine. The result was watching 20 percent of her crop scattered in the field. She plans to contribute the combine to a seed equipment cooperative she belongs to. Members have been scouring old barns across the country to find small-scale equipment that has fallen out of use as farmers have scaled up. The plan is to officially incorporate the group as as a seed cleaning facility, where, says Mai, "we'll be able to clean seeds for consumption and reproduction," as well as save them for future heritage grain farmers. So having her very own combine has made her a happy camper and farmer. Good luck, Mai! At Heritage Radio Network's East Williamsburg, Brooklyn studios. Earlier this week, I had the fun experience of being a guest on host Laura Stanley's Heritage Radio show and podcast "Inside School Food," along with Japanese documentary filmmaker Atsuko Quirk. Laura does a great job covering the nuances of the topic, and I recommend it to you. The school lunch plate, her show demonstrates, is where our beliefs about food justice, public health, childhood nutrition and education and sustainability all converge. Laura occasionally widens her focus on the American school lunch to examine the noontime repast of kids around the world. On our visit the show, the topic was the Japanese school lunch. Atsuko spoke about the making of her wonderful film titled School Lunch in Japan: It's Not Just About Eating! I added my two cents by describing the delightful experience of dropping in on a fifth-grade school lunch at Sanya Elementary School in Tokyo (part of a Foreign Press Center Japan fellowship tour earlier this year focusing on food, nutrition and Japanese cuisine). Lunch at Sanya Elementary School, Tokyo. fifth graders bring lunch food from kitchen to class. Atsuko decided she needed to introduce the Japanese school lunch to westerners after visiting her child's elementary public school lunchroom in New York City. She was appalled at what she saw: chicken nuggets strewn across the floor, indiscriminate food waste, zero clean-up effort on the part of of students, no discernable recycling measures and worst of all, a lack of gratitude toward the cafeteria lunch ladies. The lunch line; students serving their peers. illustrated with photos of what they made at home. By contrast, what she depicts in her film, and what I saw at Sanya, was the midday class period when kids take the lead, hauling large pots of miso soup and accompany dishes from school kitchen to classroom on carts, setting up a buffet line, serving fellow students, listening to a description of where their lunchtime foods were sourced, and a mini history lesson on the traditions behind those foods. Student-led chants of appreciation and gratitude began and ended each meal. They even clean up after themselves, too, and at the end of the lunch period there are no leftovers! On our visit to Sanya, we had our pants practically charmed off us by these adorable and enthusiastic kids, and were also suitably impressed with how the lunch period is handled. We learned that the Japanese government has been concerned in recent years at the rise in obesity and lifestyle-related diseases, thinness obsession among young women, the loss of traditional Japanese food culture and a series of food safety incidents that have highlighted an over-dependence on food from abroad. 20 different kinds of vegetables are grown here. 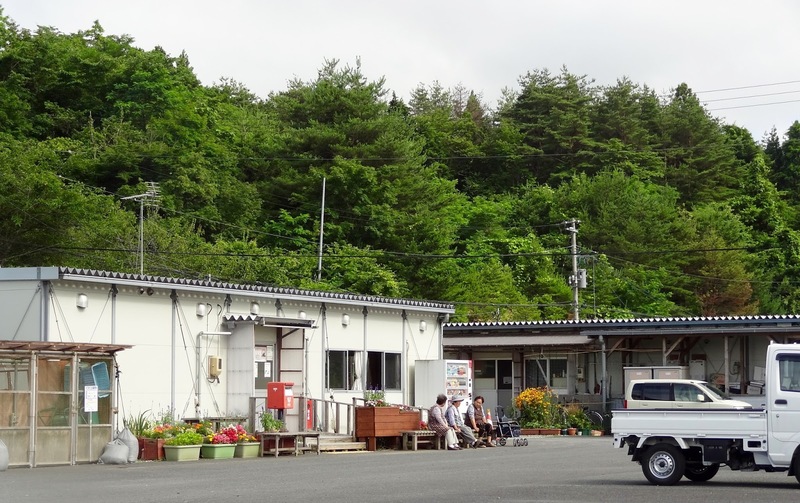 The Tohoku earthquake and nuclear disaster of 2011 shook the entire country up, explained school principal Ryoichi Yamagishi, and underscored concerns about food safety and sustainability. "Everyone is more aware of the importance of life," he said, the food they eat and where it comes from and the need for energy self-sufficiency. Since the disaster, Yamagishi noted, Sanya has cut its electricity use by half. Even before the earthquake disaster, though, the shokuiku (food and nutrition education) movement was gaining steam in Japan. The goal of shokuiku is to increase food and nutrition knowledge, food choice skills and healthy eating habits, not to mention its emphasis on gratitude, table etiquette and local food production. The government passed the Shokuiku Basic Act in 2005; in 2010, the law was amended to require that at least 30 percent of school lunch ingredients be sourced locally. Last year Sanya won the coveted designation of "Super Shokuiku" school for the excellence of its food and nutrition education program. Another aspect of the shokuiku movement that America's school lunch lacks is the incorporation of nutrition education and food and cooking literacy into the class curriculum. There are now more than 5,000 nutrition educators working in Japanese schools. They offer nutrition presentations during lunchtime, weekend cooking workshops for parents and students, and provide counseling for issues such as picky eating. Voting on future lunch entree choices. The shokuiku curriculum is standardized. Second graders learn about local foods and practice simple knife skills and food preparation techniques. They have an obento (box lunch) assignment for which they must learn to make their own onigiri rice balls. In third and fourth grade they make their own tamagoyaki (egg omelet rolls) and by fifth and sixth grades, they are able to make their entire lunch. Sanya also leases a rice field in the countryside, which students visit in the fall to help with planting and in the spring to assist in the harvest. The day I visited, the menu included Fukagawa-meshi, a rice dish, kenchinjiru (miso soup with tofu and vegetables), kibinago (silver stripe round herrings) cooked in soy sauce, half of a Satsuma mandarin orange, and milk. A student announcer explained that the rice was a Tokyo-area specialty, traditionally made with clams, miso, burdock, carrot, garlic scapes and shiitake. "Twenty years ago there were many clams in Tokyo Bay," he explained, "but today they are mostly imported from elsewhere. The dish is a local specialty that was often served at Tokyo food stalls. Today's Fukagawa-meshi has clams in it, so please enjoy the Edomae (Tokyo style) flavors." There's a lot to admire about Japanese school lunches, but Laura pointed out areas where the U.S. arguably does a better job: food and nutrition assistance for low-income students, for example, done in an unobtrusive way that doesn't stigmatize recipients. 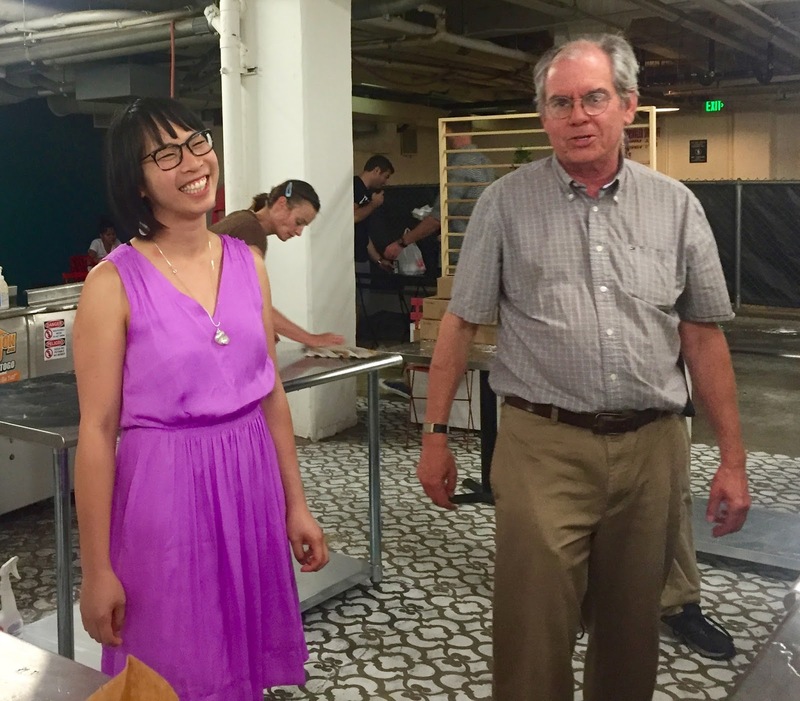 For more on school lunches, check out Cafeteria Culture, an amazing local not-for-profit organization Atsuko helps lead that has done much to make school lunches more sustainable. One of the most entertaining reads of this fall for me was Chef's Choice: 22 Culinary Masters Tell How Japanese Food Culture Influenced Their Careers and Cuisine by Saori Kawano and Don Gabor. Kawano, the founder and president of Korin Japanese Trading Corp., the Tribeca Japanese chef knife and tableware store, and writer Gabor have put together a series of interviews that will appeal to the aspiring chef or culinary student as well as anyone interesting in eating and cooking Japanese food. Each interview is divided into sections describing the chef's influences, career path, cuisine, training and "a day in the life," section devoted to amusing or instructive anecdotes. Each chef was selected for his or her affinity and love for Japanese cuisine, so it's not surprising that Japanese influences figure heavily in their cooking. Some even have to hold back to keep from overdoing it. Eric Ripert says he's channeled his exposure to Japanese cuisine into his food at Le Bernardin, and notes. "Now I sometimes restrain myself because I discover that ninety percent of the menu has a Japanese influence. Then we have to go back to French cuisine--at least a little bit!" Increasing globalization means that an aware chef is plucking influences from a wide array of cuisines. The challenge, Ripert notes, "is to be creative without being disrespectful of tradition," to help customers "understand other food cultures." But what does that mean? Slavishly reproducing classic Japanese dishes, or riffing on them in a way appealing to western audiences? When foreign chefs depart from the traditional Japanese way of doing things it can be dismaying to Japanese customers. For example Wylie Dufresne, known for his intellectual, avant garde approach to cooking, makes a pumped-up dashi that registers on the palate like a pounding tsunami, not the gentle ocean swell of traditional dashi. Where Japanese chefs will immerse their bonito flakes into their konbu broth briefly, from ten to 30 seconds, Dufresne pushes the boundaries, going for a ten-minute soak. Japanese customers will complain; this is not the soft, gentle umami they are used to. "I don't know whether it's right or wrong, but it's different." says Dufresne. Besides some mind-of-a-chef techniques, you'll learn a little about Japanese taste predilections. Cookbook author and teacher Elizabeth Andoh discusses the importance of mouth-feel to the Japanese. 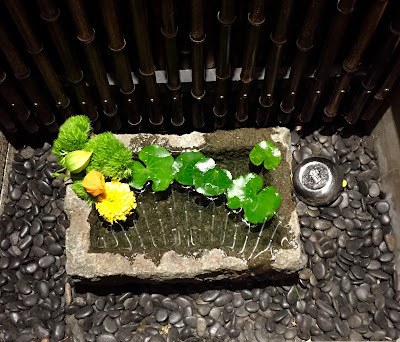 Ingredients that might be off-putting to westerners, like the neba-neba (slimy, sticky, or stringy) texture of okra, junsai (watershield, a pond green covered in a transparent jelly) or natto (fermented soybeans) are beloved in Japan. You'll also learn a bit about the history of Japanese ingredients in western cooking. In the late 1960s and early 1970s, French and American chefs began going to Japan, and Japanese chefs flocked to France to study and cook. David Bouley recalls the first time he saw soy sauce used by a French chef, by Joel Robuchon at his Saint Germain L'Atelier in Paris. Robuchon combined soy sauce with butter, ginger and lemon juice, a move that must have seemed daring at the time but now seems almost quaint. Besides Andoh, there are only two other women included, Lee Anne Wong, who gained fame on Top Chef and now heads Koko Head Cafe in Honolulu, and Toni Robertson, Executive Chef of the Mandarin Oriental Hotel Group in Singapore. Growing up in a family of doctors, to satisfy parental expectations, Robertson became a U.S. Air Force emergency room medic and served in the Air National Guard before turning to cooking. The experience wasn't a waste though. She calls it "perfect training" for professional kitchen work because she learned how to remain calm in the midst of "controlled chaos." Some of the most tantalizing tidbits involve the chefs' thoughts on individual ingredients. Marcus Samuelsson loves yuzu and smoked fish liver. Wylie Dufresne rhapsodizes about kuro edamame, or black soybeans, which he calls "a higher level of soybean that tastes almost like corn, peanuts, or a little of both," with a black outer skin but "an emerald green bean inside that shines through. When you pop the soybean out of its skin and eat it, it's so delicious and flavorful that you'll never want to go back to the other edamame." Nobu Matsuhisa highlights the importance of ingenuity and imagination when faced with a lack of ingredients. When he arrived in Lima, Peru as a young man fresh fish was bountiful, but not Japanese ingredients. To approximate Japanese rice he tried mixing local rice with sweet glutinous rice. To come up with a facsimile of Japanese rice vinegar he mixed soy sauce, acetic acid, and then later wine, kombu and salt. Without fresh wasabi, he mixed powdered wasabi with horseradish and some local hot pepper. Bouley advocates intuitive cooking "When you cook a dish that you're worried about, I suggest that you rely more on your senses... Stop thinking, because that's going to distract you." He gives the example of learning how to cook onions by paying careful attention to sensory input every step of the way. "What do they smell like they they are cooking and getting sweet?...What do they smell like then they are still full of water? They smell bitter, they smell acidy. Trust your senses and they will not lie to you." The chapter on Australian chef Ben Flatt, who married his wife Chikako and then worked with her parents at their Noto Peninsula guest house Sannami, is fascinating. Flatt learned Japanese knife techniques, fermentation, pickling and seasonal cooking from his in-laws, and he and Chikako now run an inn and cook "Noto-Italian" cuisine at Flatt's by the Sea. They make 400 litres of ishiri, a fermented squid sauce, a year. One of his dishes involves hinazushi pickled fish that tastes like blue cheese paired with deep-fried flying fish wings and dressed with a mix of sansho leaf, olive oil and sugar. All of the chefs, not surprisingly, recommend working hard, no matter how lowly your first position in the kitchen turns out to be, adapting to any working condition, and figuring things out on your own. A common criticism of American-trained chefs is that they need to be spoon-fed recipes and techniques, a far cry from the Japanese system, where no one teaches apprentices anything; they are expected to learn by watching how the masters do things. Yosuke Suga, whose father ran a French restaurant in Nagoya and who worked for ten years as Joel Robuchon's trusted lieutenant, says that as an apprentice and later chef in both Japan and France, "nobody trained me or taught me recipes. I had to observe and absorb them." Today's culinary school grads, he notes, are alway on the lookout for the next best gig. "But even if the chefs are smart and learn the technique in just one year, they cannot learn philosophy or patience...it's difficult to trust them on a deeper level." Here's some of what I collected at Tanka Sunday in Albany over the weekend. Tanka, the ancient form of Japanese poetry, is alive and well, I found out. Two lines longer than haiku (formulated in a 5-7-5-7-7 syllable pattern instead of haiku's 5-7-5) it's being given new life every day by by ardent practitioners of the form, not just in Japan, but around the world. 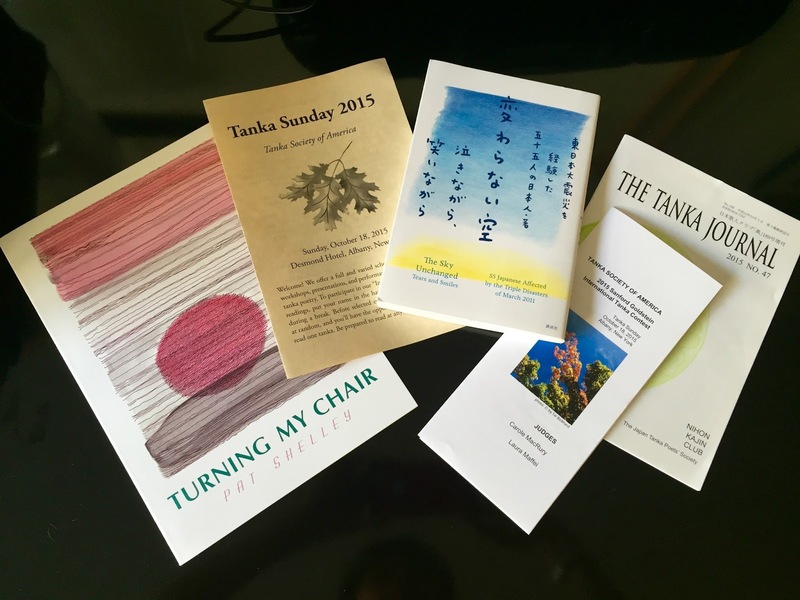 Present at the Tanka Society of America's bi-annual meeting were poets from the U.S., Canada, Australia and Japan, who shared their poems and discussed why it is they write tanka. Pulled into this world of verse by a collection of tanka that my grandparents published in 1960, little did I know that it would lead to such a rich and warm community of like-minded poets. Included in the photo above, center, is The Sky Unchanged: Tears and Smiles, a collection of tanka about the March 2011 Tohoku earthquake and nuclear disaster, many of them written by survivors themselves. Amy V. Heinrich, former director of the C.V. Starr East Asian Library at Columbia University, was one of three translators who rendered the poems into English, and also the keynote speaker at Tanka Sunday. Michael Dylan Welch, the founder of the Tanka Society of America, also runs a small press for haiku and tanka books called Press Here. On the left in the picture above is his most recent tanka publication, a beautifully designed and produced collection of tanka by the late poet Pat Shelley, titled Turning My Chair. On the right, is the latest edition of The Tanka Journal, from the Nihon Kajin Club (Japanese Tanka Poets' Society). At 5,000 members strong it's the largest organization of tanka poets in Japan. Editor-in-Chief Aya Yuhki, who studied English literature in university, traveled from Tokyo to attend Tanka Sunday. My friend and translator Kyoko Miyabe and I each gave presentations on our forthcoming English-language translation of my grandparents' book, By the Shore of Lake Michigan. Yet for sure, it was we who learned more about tanka from the assembled poets, not the other way around.